While cancer immunotherapy has come of age in recent years, the development of novel immuno-oncology agents still faces many challenges, including a lack of preclinical models with humanized immune systems, which are pioneering platforms for the evaluation of new human anticancer agents. 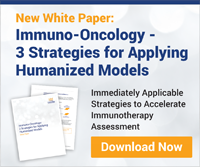 Within our In Vivo Immunotherapy Translational Technology Platform, we have developed a suite of humanized models, designed to fit a wide range of client needs across this diverse field. Our hematopoietic stem cell (HSC) Patient-Derived Xenograft (PDX) models combine our vast collection of 2,500 HuPrime® PDX models with humanized CD34+ NSG™ mice (Hu-NSG) from The Jackson Laboratory. Translational population studies to better understand responder and non-responder profiles. Looking For a Simplified Approach? 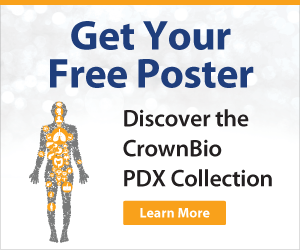 For a simple alternative to full stem cell reconstitution, CrownBio provides MiXeno™ models of transient, partially reconstituted human immunity, created by mixing human peripheral blood mononucleated cells (PBMC) with Cell Line Derived Xenograft models. Our MiXeno models are currently available for a range of cancer types including breast, colorectal, lung, lymphoma, and melanoma. The MiXeno platform is available for a variety of immuno-oncology applications including BiTE®-like antibodies, checkpoint inhibitor assessment, antibody-dependent cellular cytotoxicity (ADCC) effects testing, and NK modulating agent evaluation. Human biological therapeutics such as checkpoint inhibitors require models expressing human targets for their evaluation. 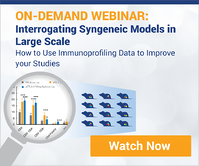 While syngeneic models can be used for surrogate anti-mouse checkpoint inhibitor testing, they are not suitable for human biological therapeutics due to species specificity issues. CrownBio therefore provides HuGEMM™ - our unique platform which allows the evaluation of specific human biological therapies in vivo, in mice with a fully functional murine immune system featuring a humanized drug target e.g. with the murine target protein directly replaced with its human counterpart. HuGEMM models are currently available for PD-1, CTLA-4, and OX40, with CD137, TIM3, and PD-L1 models undergoing validation. For agents targeting proteins expressed on tumor cells our sister platform of HuCELL™ is appropriate – where engineered mouse tumor cells express humanized ligands such as PD-L1. All of our humanized models are fully validated with treatment data and immunoprofiling and phenotyping available, providing confidence throughout our full In Vivo Immunotherapy Translational Technology Platform.